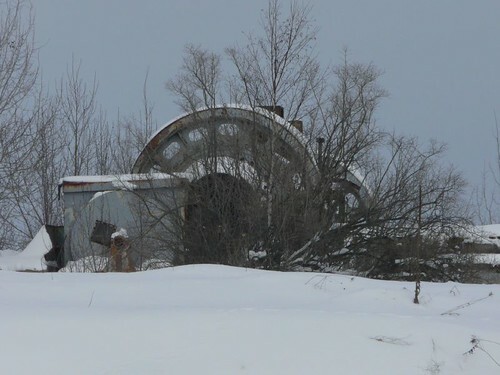 There are supposedly over 9000 abandoned mines known to exist in Ontario – shafts, caverns and tunnels, many collapsing, unstable or traps within which poisonous gases settle. At this mine the granite hillside is undercut. Here a fallen boulder, streaking in oxidizing mineral residue, partially blocks a downward leading cavity. From another enthusiast I have learned that there is more to the mine than what I could see (I did not go in past the entrance which appears to end abrubtly). Unless there is another entrance off in the bush, this must have been the way that the old miners had followed the vein. I understand that there is a tunnel that leads down into water and at least one other that dead ends. 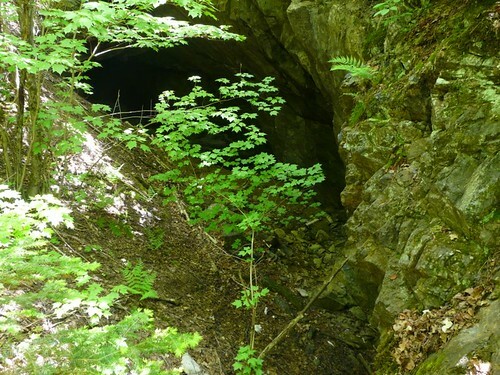 Don’t explore abandoned mines, they are deadly and many people loose their lives in them each year. Apparently 2489 tons of ore were produced from this mine. It was estimated to be worth around $8500. 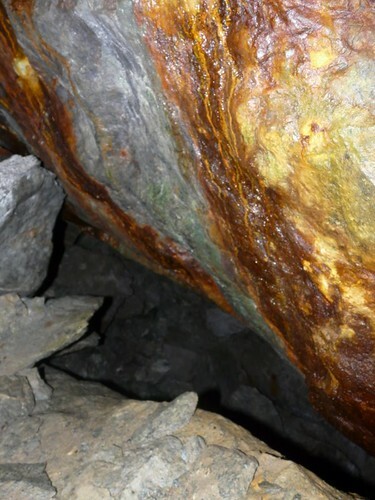 The vein in which the gold was found was obviously one of quartz. 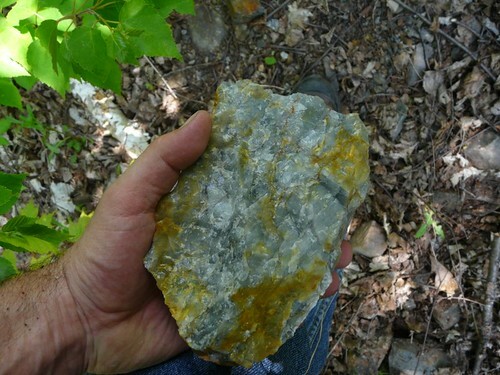 There is a fair bit of massive quartz scattered through the bush near by – some of the rock is translucent white and other pieces tend toward a waxy grey or even black. There must be some radioactivity in the rock for this variety of shading to have taken place. 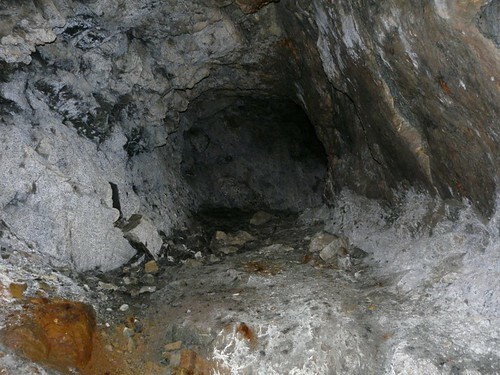 The mine was worked until the early 1900’s and then, as was speculated – they must have lost the vein and closed in 1909 – supposedly it had shifted. Low gold prices made further exploration pointless, but drilling in 1938 revealed some significant amount of gold below – again the gold prices were said to be so low that a mining venture could not be justified. An American company made an unsucessful attempt at revival in the 1980’s. You might imagine that I have lost interest in the mineral world, but it is not the case – work just becomes all-consuming some times and I need to set my personal life aside, but summer holidays are here again and its time to re-establish interest. This past week took me north of the “Soo”, Sault Ste. Marie for those who are not familiar with the expression “Soo”. Up there, past Batchewana Bay, the shield is absolutely ancient, high hills, possibly more rugged than down around Bancroft, but no less dotted with old abandoned mines and rock hounding sites. Sadly, there is little in the way of karst as I am used to seeing it – so no caves, or none that I saw. 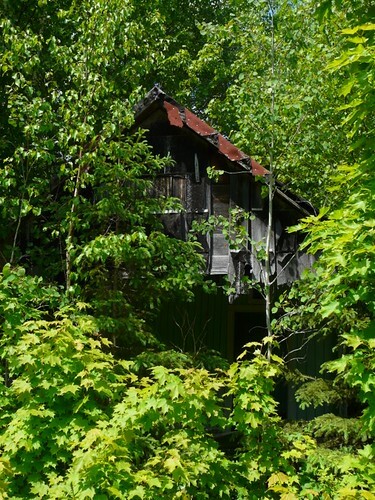 This picture is of an deserted house at an abandoned gold mine that I explored (more to come on that).